Ask anyone who has ever owned a car with a manual gearbox – in real life and in video games, nothing beats stick shift. 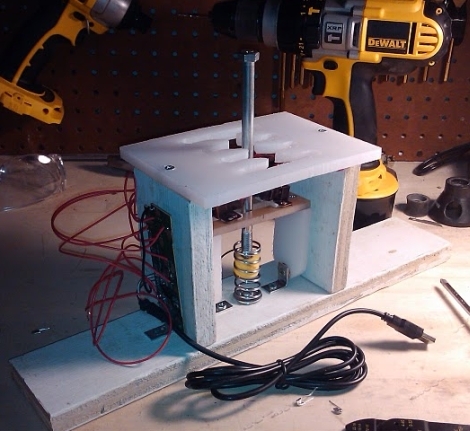 Rather than shell out gobs of money to purchase a pre-made shift box, forum member [nikescar] built his own for about $20. Using some scrap wood and a plastic cutting board, he went to work building a prototype. The “H” shift pattern was designed in CAD and laid over the cutting board, which was hand-cut with a Dremel. Using some tips found online, he constructed a simple shifting mechanism, then wired in a cheap USB game pad found on Ebay. Using safety pins as temporary micro switches, he ran a few laps, and was quite happy with the results. Once the switches arrived, they were fitted to the shift box and it was off to the races. [nikescar] reports that the shifter works extremely well, allowing him to row through the gears with the greatest of ease, sans any fear of breaking things. Keep reading to get a better look at the shift box internals. Manual cars are more fun but a modern automatic can shift just as fast and just as firm or soft as a manual gearbox. With perfect shifts every time. They even get the same gas mileage with locking torque converters. I prefer a stick shift myself but just wanted to put my $0.02 in. Nice concept and I like the results. However I would miss the feel of the gates, all the little feedback I get. One thing that is a little more harder to do with an auto or a sequential manual for that matter is if you want to miss a few gears when shifting down, like from 5th to 3rd. With a ‘H’ pattern it’s easy. would be interesting to see a controller and game that can support this technique. Well done Nikescar, for too long I’ve believed that H-shifters for games are either crummily made or horrifically overpriced, you just proved that a good H-shifter can be made for peanuts and these $500 kits are all just mark-up. I’d add a bass shaker to the internals to replicate the vibrations from the engine, which would be automaticaly rev related. Manual all the way, its the only way to have true control of your car. You can see my Fanatec ClubSport pedals in my forum post. The analog clutch works great in GTR Evo, Forza, LFS and iRacing. I used ffshifter for awhile, but it burned out the PWM motor driver in my logitech wingman pro. @nikescar: This is a fantastic build. I will be stealing this idea for my own shifter setup (If I do a writeup I will of course credit you). Hello i love your shifter, nice work, but how can i made it work whit an xbox360 and forza 4?